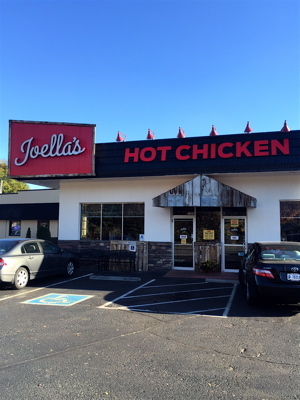 Fans of fried chicken and spicy goodness have a reason to rejoice, Joella’s Hot Chicken has arrived in Louisville. 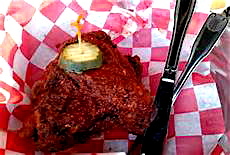 The two joints known across the globe for hot chicken are located south of Louisville. Gus’s Fried Chicken in Memphis and Prince’s Hot Chicken Shack in Nashville. These are iconic locations that are must visits in either city. Each oozes with local character and speaks to the unique cultures defined by these classic locales. Joella’s is more of a chain restaurant waiting to happen. It is the brainchild of Louisville restauranteur Tony Palombino. If you know BoomBozz Pizza, that’s Tony. Overlook Joella’s obvious attempt at creating a faux country store, with its old license plates, soda coolers and throwback signage. It’s a lame attempt at charm, but whatever. Just step up to the counter and order the chicken. I went with the Quarter White (breast and wing) for $9. Get a second of each for $3. Yes, please! The spice levels start at Southern for no heat; Ella’s Fave offers a burst of flavor and lil’ heat; Spiked Honey is a sweet and mild offering that is served on the side; Tweener is medium; Hot is spicy fire; or there is Fire-in-da-Hole (for those needing the inferno treatment). A word to the wise, these temperature readings are not the kind usually found around here or in the Midwest – whereby ketchup is considered mildly spicy. To Joella’s credit they light this chicken up with flavor and spice. I ordered one quarter with the mild Ella’s Fave and the other Tweener. You will want a beverage standing by for Ella’s Fave. Packed in spice then fried crispy, the heat grows with each bite. The Tweener needs no waiting. Touch a finger on the umber-colored bird and lick – it’s an instant attention getter. My mouth burned and eyes watered, but these were expressions of pleasure. Both selections were wonderful. Inside the delicious crust of spice is a moist and tender bird, bursting with flavor. Selections are served with a slice of white bread underneath (very southern indeed) that turns orange as it soaks up all the spicy juices. Two sides came with it, and I selected Crispy-Thin Parm Garlic Fries and Red Skin Potato Salad. I recommend both. Additionally, there are wings, chicken tenders, chicken and waffles, mac ‘n cheese, Boylan hand-crafted sodas, lemonade, sweet tea, beer and banana puddin’ – all the southern comforts you might expect. If you are feeling a chicken crave coming on, get yourself over to Joella’s for a fix of spicy goodness. This entry was posted in Food, Reviews, Travel and tagged Gus's Fried Chicken, Joella's Hot Chicken, Prince's. Bookmark the permalink.